G-series nerve agents, such as sarin, tabun, and soman, would cause tremendous harm in military and terrorist attacks, so it is necessary to develop a simple method for the rapid and efficient detection of these hazardous substances. 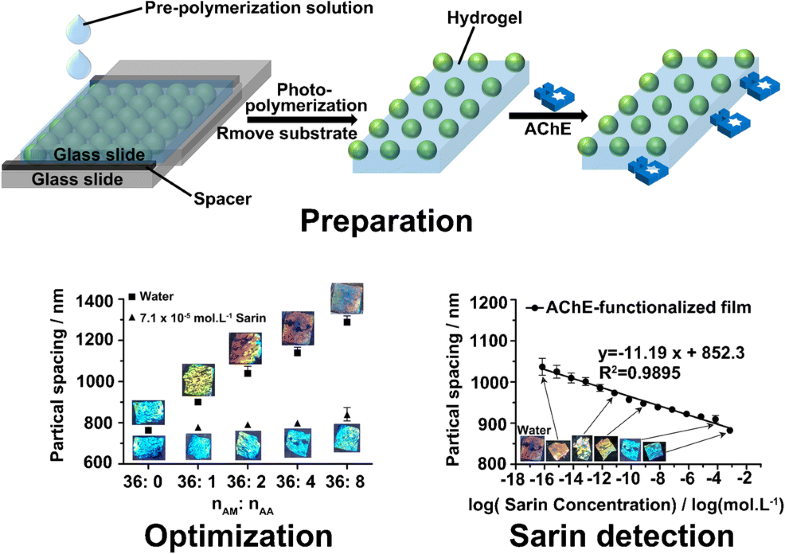 We have developed a tunable acetylcholinesterase (AChE)-functionalized two-dimensional photonic crystal (2D PhC) for the detection of a real nerve agent, sarin. In accordance with the 2D PhC previously prepared by our group, the AChE-functionalized 2D PhC was optimized by adjustment of the amount of monomer in the hydrogel, which not only increased the sensitivity of the 2D PhC, with the detection limit decreasing by two orders of magnitude, but also ensured the structural color spanned the whole visible region in the detection range. A linear relationship between the logarithm of the sarin concentration and the particle spacing of the AChE-functionalized 2D PhC was observed from 7.1 × 10-17 to 7.1 × 10-4 mol/L. The AChE-functionalized 2D PhC also responded to mimics of G-series nerve agents, including dimethyl methylphosphonate, diisopropyl methylphosphonate, and isodipropyl methylphosphonate, to various degrees. 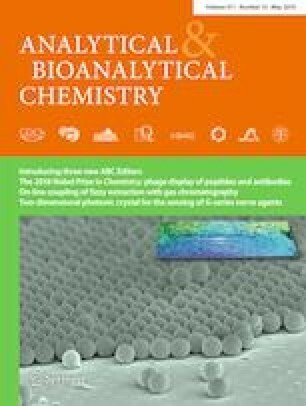 The proposed 2D-PhC hydrogel has potential for low-cost, trace-level, and on-site monitoring of other G-series nerve agents. The online version of this article ( https://doi.org/10.1007/s00216-019-01700-w) contains supplementary material, which is available to authorized users. This research was supported by the National Natural Science Foundation of China (grant numbers 21375009 and U1530141).